This year on Super Adventures, things are still pretty dead and that's not changing any time soon. Sorry about that. But I do have a surprise guest post by my cat-obsessed associate game critic mecha-neko for you to enjoy! Hello! I'm mecha-neko and I'm back for another Obscure-As-All-Hell Animated Cat Game August! 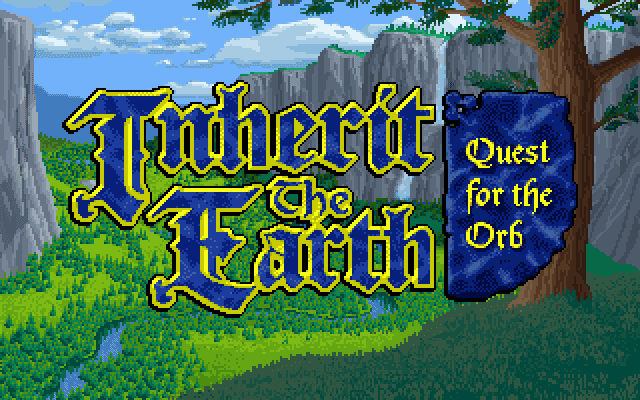 Say hello to Inherit The Earth: Quest For The Orb, also known as Erben der Erde: Die Grosse Suche (Inherit The Earth: The Great Search) in German. This is an adventure game that's been on the super Super Adventures adventure game wishlist for a long time, but it's only now that a copy has arrived in my paws. It's all about walking, talking animal-folk, so I'm certain I'll bump into a cat at some point. I'm playing the original MS-DOS CD-ROM version as it makes producing these wonderful .gifs for you much easier, but the Steam version is identical, pixel-for-pixel, as far as I can tell.